A.With the inner black or white cavities divided in to 64 sectors (Type 01-02), 60 sectors (Type 03-04) and 32 sectors (Type 05-06). Depth 2 mm. B.With circular cavities (1, 2, 4 with the diameter 12,5 mm of each one) (Type 07-12) and black or white backround. Depth 2 mm. 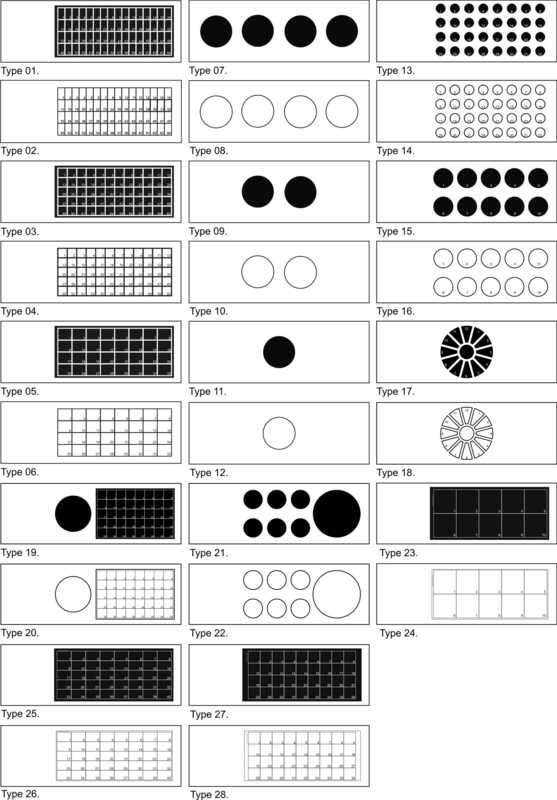 C. With 32 circular cavities (diameter of each one 4 mm) (Type 13-14). Black or white backround. Depth 2 mm. D.With 10 circular cavities (diameter of each one 8 mm) (Type 15-16). Black or white backround. Depth 2 mm. E.With sun like division of cavities (one central cavity and 12 surrounded). (Type 17-18). Black or white backround. Depth 2 mm. F. With 40 sectors and one circular cavity (Type 19-20), black or white background. Depth 2 mm. G. With one large circular cavity ( 20 mm) and six smaller circular cavities (diameter 8 mm of each one) (Type 21-22), black or white background. Depth 2 mm. H. With the inner black or white cavities divided in to 10 sectors (Type 23-24). Depth 2 mm. I. With the inner black or white cavities divided in to 40 sectors (Type 25-26). Depth 2 mm. J. With the inner black or white cavities divided in to 36 sectors (Type 27-28). Depth 2 mm. Our microslides are made of white high quality woodfree cardboards (certificated conservation board with alkali reserve) of 2 mm thickness. They are covered by 1mm thick glass and are easily to be inserted in to the aluminium slide holder. Laser cutted microslides . Using this method is achieved perfect flatness and no crevices because the material is not deformed by processing. It is the best way to produce high quality microslides. Also is possible engraving of species/author names, localities on the microslide surface. Ideal for storage of large or private collections! Based on your proposal and the discussion with us we are able to realize also another types of microslides! !